With motion detection that's not over-sensitive to light and shadow, plus that loud built-in alarm/siren system, the Somfy One has lots of appeal. It is not without its flaws though, as even the paid plan doesn't offer access to captured footage from days or weeks prior. Whether the Somfy One appeals will therefore be down to your personal needs. When it comes to protecting your home and your family, there are plenty of smart home security camera options to choose from. So many, that it might be hard to decide which one is right for you. Which is why manufacturers are working hard to deliver powerful smart home cameras with a variety of capabilities to pique your interest. If you're looking for a system that can not only keep an eye on your home, but help ward off unwanted guests using a siren/alarm system, then the Somfy One could be just what you're looking for. But is it worth the money? The Somfy One is large compared to other home cameras we've tested, in part due to the features. 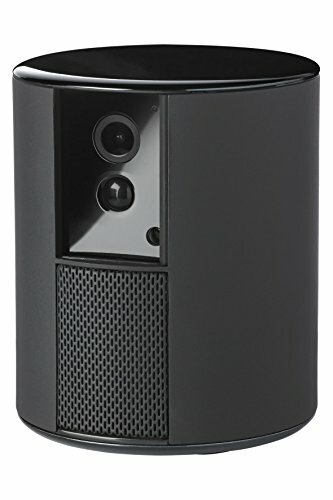 The bulky body houses a siren/speaker system, the 1080p camera lens, sensors and a privacy shield. That's more than most of the competition. In its black finish (it's also available in white), it's far from subtle. But with a hefty siren built in, subtlety probably isn't what you're after. The supplied Micro-USB power cable is long, but not terribly easy to hide - which isn't ideal if you're a neat freak who's obsessed with cable management. Initial setup of this camera is probably the easiest we've experienced in this category. Plug it in and download the app (available for Android and iOS devices) and then simply follow the in-app instructions. This involves getting the camera to scan a QR code on your phone to pair it with your device and connect to the network, which is wonderfully easy. Like other smart home cameras, the Somfy One works by recording footage that's then accessible via the cloud. This footage is available with both free and paid plans, according to your needs. You'll need a good internet connection, but the video capture is secured and easy to access anywhere, whether you're on the same Wi-Fi network or not (no surprise given the connectivity, see the bullet point geekery above). Out of the box, the default settings on the camera are 720p HD, i.e. video is captured at 1280 x 720 resolution. You can switch to 1080p Full HD (1920 x 1080), though this is likely to use more bandwidth and data allowance on the home broadband and on your phone if you're regularly viewing and downloading footage while outside the home. The Somfy One's 130-degree lens gives an excellent view of the room its in, as it's super wide-angle. We found the captured video quality to be excellent and superior to some other 1080p cameras we've tested. We were also impressed with how well the Somfy One handled low-light situations in rooms where cameras like the Canary Flex struggle. At night or in really low-light levels the camera switches over to night vision mode with a distinct "click" and records in black and white (using infrared). There's an eight times digital zoom which gives you the ability to get a closer look at things or people in the room, too, but as with all digital zoom cameras the quality gets grainy very quickly. The only downside we encountered with video playback was with sound quality. There appears to be an issue with feedback where a low buzzing/humming sound comes through. This impacts the levels and makes it tough to hear what's being said in the room. This could be a problem if you need the video for evidence of a break-in, but also presents an issue when using the two-way communication function. The Somfy uses its motion sensors to look for movement, kicking into recording mode when automatically activated. These clips are available to download in MP4 format and appear within the app for 24 hours, after which they're wiped. On the free plan only 10-seconds of each clip is available to watch or download. Live footage is also accessible and clips downloadable - but only on the paid subscription (and for the first 14-days of ownership as there is a trial period for new owners). You can adjust the sensitivity of this motion detection within the app and even adjust the area it should sense motion within. In theory, this means you can adjust it to monitor a doorway and avoid detecting shadows from windows or movement from trees outside. There's a five metre distance limit to detection, so you don't need to worry about unnecessary things setting the camera off, but might need to think about positioning in a large room. In practice, the motion detection doesn't seem to be triggered by everything anyway: cats often passed by undetected; but our robot vacuum cleaner set it off; and people entering a room certainly set the system into action. The Somfy One also has a range of interesting settings for privacy control. The design has a built-in motorised lens cover, which can be controlled using the app. On other cameras, you can turn off recording, but if you're paranoid about people hijacking a feed of your home then the Somfy One goes a step further with this physical feature. Since the Somfy One is wired, you might be forgiven for thinking that it could be beaten by being unplugged or moved, but the designers have thought of that. The camera detects if it's interfered with, will alert you if it's moved, and so it cannot just be turned or lifted without going off. There's no way for someone to sneak up on this camera and stop it from doing its job to some degree. There's a range of settings within the app that give you the ability to tell the camera where you live, too, so it knows when you're leaving the house and it will remind you to activate the built-in alarm. There are additional settings and accessories you can use to improve this alarm-setting experience, including keyfobs for family members, window sensors and more, resulting in an expandable smart home security system. We were impressed with the performance of the alarm. It's capable of delivering a powerful and loud siren when it detects any unwanted presence. And when we say loud, we mean it: it's around 90dB, which is painful. How this alarm functions depends on how you set it up. By default the camera will give a short warning sound when movement is detected before kicking off the full siren. You can change this so the siren goes off straight away if you prefer. Thankfully, we didn't find the alarm blasting out at the slightest of movement or change in light. If you're not at home then a push notification will be sent to your app and also via email (to multiple family members if you wish), so there's not much chance of missing the warnings. As if that wasn't enough, there's also a two-way communication system that you can use via the app, thanks to the Somfy's built-in mic and speaker. This means that you can talk to people in the room, whether that's addressing family members, telling the dog to get off the sofa or asking burglars to exit before you call the Police. The Somfy app has some other tricks up its sleeve too, including smart home integration and voice control. You can set the camera to pair with a Nest Thermostat, for example, so when you activate the alarm Nest will know you're out and this will help with fuel efficiency. The app and the camera are also compatible with IFTTT, which gives you access to a range of recipes to cater how it works to your own needs. "Alexa, Ask Somfy to arm the alarm"
"Alexa, ask Somfy to enable night mode"
"Alexa, ask Somfy what happened this week"
To get a taste of what the £3.99 per month subscription offers, the Somfy One comes with a 14-day free trial. Once that trial is up, you'll find you're on the free plan - which allows you to view live footage from the camera, but removes the ability to review footage from the previous 24-hours. You still get the event recordings which captures 10-second snapshots when movement is detected, but this only happens when the siren is activated, meaning you won't get any notifications when that's off. As noted above, we found motion detection a bit of a mixed bag. Sometimes obvious movement isn't recorded. There's also a delay in the availability and playback of event recordings (they're not immediately available or will return error messages about playback when you first try to click). The Somfy One certainly presents an interesting alternative to the other smart cameras and plans out there. We found the addition of the siren and privacy shutter makes this camera an interesting option. But when you consider that other devices like the Logitech Circle 2 offer 24-hour playback of footage for free, then the free plan on the Somfy One isn't as useful or as appealing. That £3.99 per month rate isn't too bad, but the initial purchase of the camera skews that slightly. At over £200, it's an expensive choice, despite the obvious advantages of the design. The Somfy One has some features that make it an excellent smart home camera. We're impressed with its wide-angle lens, ability to capture footage in low-light situations, the range of flexible options, physical privacy shutter, and the sheer volume of that built-in alarm/siren. Compatibility with other systems, such as Nest, Alexa, Google Home and IFTTT, make the Somfy even more flexible for your smart home needs. Plus you can expand the system with optional extras such as sensors and security fobs. Unfortunately, there are some quibbles that let the side down: the quietness of the two-way communication system; the lag in video capture; and the limitations of the free and paid plans (meaning you can't review footage from further back in time, such as over days of weeks). That last point will be a deal-breaker for some, we suspect, especially when the Logi Circle 2 offers so much more. The Somfy One won't suit all, then, but with motion detection that's not over-sensitive to light and shadow, plus that loud alarm system, it's a solid step in the right direction for an all-in-one smart home security camera. Canary is a strong contender for the smart home camera crown. It lacks facial recognition but we found it offered a strong experience, despite the subscription requirements. It also boasts some pretty clever features like the ability to track where household members are (i.e. away from home or not) and arm itself accordingly. It's certainly a more affordable option and one worth looking at. We found the Withings Home to be a lot more than just a smart camera, it's nearly an all-in-one smart home solution with a camera, video recorder, night light, speaker and more besides. A beautiful design, a wide range of features and functionality and all-round performance should put the Withings Home on your radar. The Logitech Circle 2 certainly has a lot to offer and some stand-out features that make it a worthwhile addition to your home. With 1080p streaming, two-way communication, automatic night vision and a super wide angle lens this camera has it all.